The Cyclone Power Pullers broke with previous designs and built a segmented, four-wheel-drive tractor for this year’s competition. Photo by Christopher Gannon. Larger image. Update: The Cyclone Power Pullers finished fifth overall in the 2018 ASABE International ¼ Scale Tractor Student Design Competition, held in Peoria, Illinois, last weekend. The Power Pullers tied for first with the University of Nebraska in the written portion of the competition and took home top honors for their tractor’s appearance, maneuverability and innovation. Team leader James McCormick said he’s proud of the way the team and tractor performed, and he credited the tractor’s articulated, four-wheel-drive design for much of its strengths. The competition drew around 30 teams, and the fifth-place finish improves on the Power Pullers’ 20th-place finish in 2017. McCormick said it’s too soon to know for sure what next year’s tractor will look like, but he said it’s likely the team will try to carry over many of the successful aspects of this year’s design while improving durability. AMES, Iowa – New look; same goal. The 2018 Cyclone Power Pullers, a student organization that designs and builds a quarter-scale tractor from scratch, have made some radical changes to the machine they’ll enter into competition next month compared with tractors from previous years. New rules for the 2018 competition granted teams access to more options, and the Power Pullers are taking full advantage. They hope their tractor’s articulated frame will improve performance and move them up in the competition rankings. James McCormick, a junior majoring in agricultural engineering who oversaw the tractor’s design, said the easing of design restrictions for the competition, organized by the American Society of Agricultural and Biological Engineers, could lead to a more varied contest. Owing to the new rules, the Power Pullers decided this year to design an articulated tractor composed of two segments with four-wheel drive. That contrasts sharply with the club’s two-wheel-drive designs of the past. McCormick, a native of Steward, Illinois, said all four wheels of the 2018 tractor feature full-size tires, whereas the old competition rules required front tires to be smaller than the rear tires. “Our tractor this year is more like the high-horsepower tractors that you see in the field than the utility-type tractors we built in the past,” McCormick said. The segmented design allows for better maneuverability and turn speed, he said, while the full-size wheels should improve durability and traction. The team named this year’s tractor “CY-ger,” a play on the name Steiger, an old ag manufacturing brand known for building segmented, four-wheel-drive machines that partially inspired the Power Pullers’ design. The competition starts May 31 in Peoria, Illinois. The entrants are judged on a range of criteria including performance, safety, ergonomics, manufacturability and maneuverability. In addition to tractor performance, the team will also be judged on a written submission and oral presentation. The Cyclone Power Pullers finished 20th out of 30 teams at the 2017 competition, and McCormick said this year’s team is looking to improve on that performance. They took the constructive criticism they received last year to heart and hope to capitalize on a wealth of returning experience, McCormick said. For instance, McCormick said he’s been involved with the Power Pullers since his first year at Iowa State, and he plans to return to the team next year for his final competition before graduation. This summer, McCormick intends to complete an internship with Vermeer, an agricultural manufacturing company in Pella. 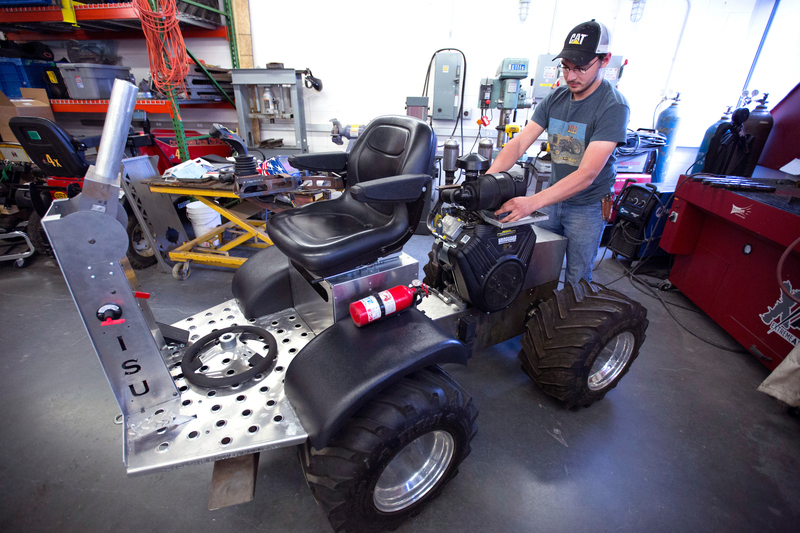 The quarter-scale tractor ISU students will enter into a competition in a few weeks draws a stark contrast to the club’s efforts in previous years. 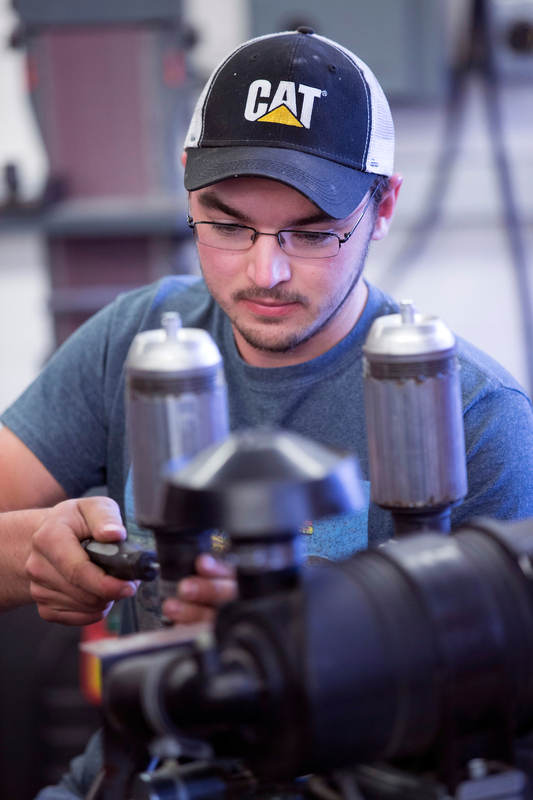 Changes to the competition’s rules allowed the ISU team to build a segmented tractor that team members hope will allow for greater maneuverability. James McCormick, A-team leader of the Cyclone Power Pullers, works on the club’s tractor in their Sukup Hall shop. Photo by Christopher Gannon. Larger image.